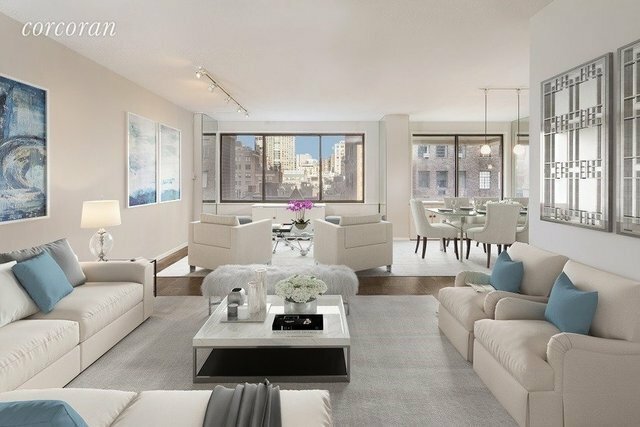 Located right off Madison Avenue in charming Carnegie Hill, this sun-flooded three bedroom, three bathroom home is located in a premier co-operative. One enters the residence through a gracious entrance foyer with three large coat closets. Off the foyer is the oversized living room that has three picturesque windows overlooking an architecturally beautiful church and a dining area with another two windows that bathe the room in sun. There is a windowed kitchen with custom built-ins and ample storage. The magnificent master bedroom has an en-suite bathroom, three huge closets and windows facing south over scenic tree tops. Adjacent is the second bedroom with a windowed en-suite bathroom that faces south and another large closet. Finally, the third bedroom faces east with two closets and a hallway bathroom. The residence has through the wall air conditioning and hardwood floors. This white-glove building has spectacular amenities, which include a full-time doorman, concierge, resident property manager, fitness center, parking garage, bicycle storage and landscaped garden.